After hours and hours of writing, countless of hours of research (don’t feel too bad for me, the research included making lots of beer), Homebrewing For Beginner is officially here! When I first got into making my own beer, it wasn’t a pretty process. I couldn’t wait to dig in and start getting dirty, but the homebrewing process seemed to have a steep learning curve. I read a few books and they helped, but I still didn’t know what equipment I really needed (or where to get it), didn’t understand the complicated jargon and I was worried I was going to make a mistake on my first brew day that would ruin my beer. That’s why I put together Homebrewing For Beginners. It’s a to the point guide, written in plain English to help someone that has never brewed beer before. Homebrewing For Beginners covers the required equipment, only the stuff (see, no technical terms) that a beginner brewer would need, so you don’t spend money on the equipment you don’t need. This homebrewing guide goes over the ingredients that you’ll need for making beer and puts them into plain English so that you’ll know why you need them and what they do for your beer. And finally, I walk you step by step on your very first brew day. It’s not the same as having me in the same room as you, but I tried to make it very simple and easy, answering all of the questions that I had as I made my first beer. Bonuses include two checklists that I wish I had on my first brewing day. The first is a complete list of equipment that you’ll need, so that you don’t realize that you’re missing something when it’s too late. The second is a step by step checklist of everything you’ll have to do in the process of making your beer, so that you don’t skip a step. 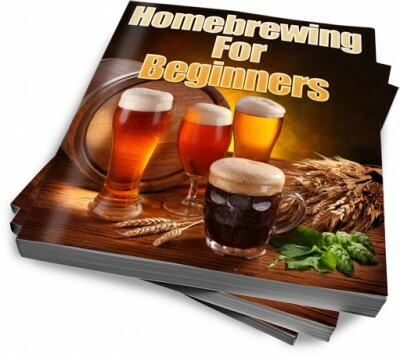 Buy Homebrewing For Beginners for just $9.95 in .PDF format. You can also find the Kindle version of Homebrewing For Beginners on Amazon.